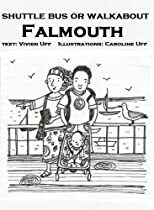 The long e-reader version of a geographical and historical guide to Falmouth in Cornwall, England, linked to the route of the frequent shuttle bus and including the author’s memories of growing up there in the 1950’s. There is also a shorter e-reader (77p) and a printed pocket leaflet widely available locally (50p). Make the very best of your time in the town by using the free map together with this guide to target everything you want to see and do during your visit. Falmouth has so much to offer: a fascinating seafaring history, a beautiful harbour and bay side beaches, luxury and budget eateries, shops and galleries to die for, a very active Tudor castle!, a full calender of events, world-famous August yachting week and it can all be seen with or without the help of the frequent shuttle bus. The trail is linked to the route so you can not be lost or overtired. Try it! You won’t regret it. The condensed version of this follows the same trail as the printed pamphlet ‘Shuttle around Falmouth’ on sale in Cornwall for 50p or a signed copy will be sent on receipt of 2 stamps at Faltalk at 1, Thorpe Grange Gardens, HD5 8BY or 7, Mount Edgcumbe Terrace, TR11 2BS.